“A lot of us wake up at 6:00 a.m. to begin our work day after a good night’s rest, but Nate Hardy isn’t most people. 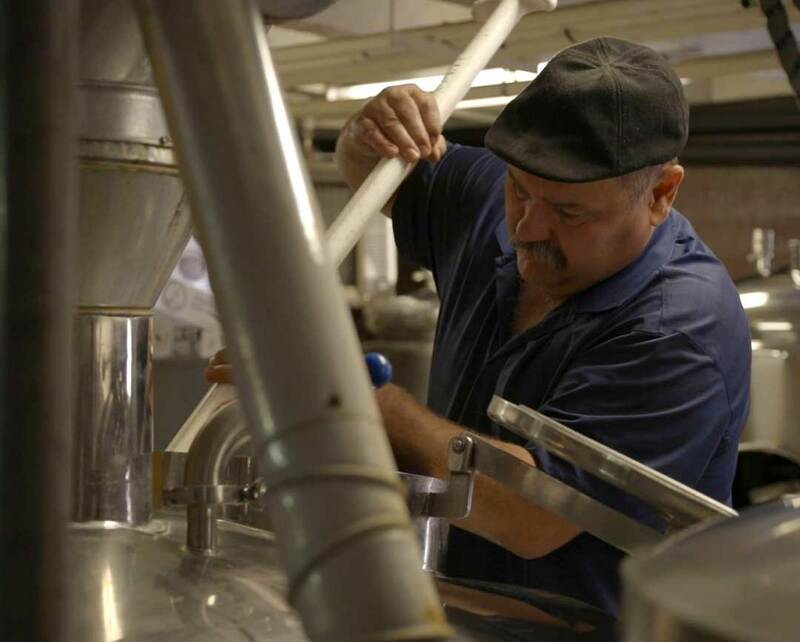 After a 13-hour night shift at a local coal mine where he has worked for the last 29 years, Nate is now on his way to his other full time job at Gillette Brewing Company and Gone Postal Pizzeria, his full service microbrewery and restaurant in downtown Gillette. Nate and his wife, Dawn, own and operate the microbrewery and pizza restaurant which has become a beloved staple for residents and visitors alike. Nate is the head brewer and maintenance man. Dawn does everything else, as the Hardys like to tell folks. On this morning, like so many other mornings, Nate has a list of tasks to complete before he can head home to grab a little sleep, which includes checking on the beer fermenters, tightening up a leaky faucet and cleaning the floors. But for now, he’s taking some much-deserved down time. It may be sunrise, but Nate is going to sit down at his bar and enjoy a pint. His beer tastes even better after a long night of work. The hardworking people of Gillette are the power behind the natural resources that power the nation. Nate is in a long line of energy industry employees within both his family, as well as Dawn’s. His father was a state mine inspector, and two of Nate’s brothers worked in the field, like Dawn’s fathers and brothers who also worked in the mines. Now they have several nieces and nephews in the coal mines, and one of their sons works in the oil field. Gillette Brewing Company & Gone Postal Pizzeria reflects those deep ties to the energy industry. Drill bits hang on the walls and railroad ties line the bar. The Hardys wanted their business to be a celebration of the town where they grew up and raised their seven kids, and energy is an integral part of Gillette’s story. Gillette Brewing Company opened in 2012, but its history goes way back. The building was originally a post office in 1935, and it’s the only structure in Gillette on the National Historic Registry. When the Hardys selected this location, maintaining the integrity of the building was a top priority, and it still closely resembles the post office that they frequented growing up. The windows and wood floors are all original, and they kept the frames of the teller windows and post office boxes in tact. They converted the original walk-in safe to their food cooler, so Dawn likes to joke with customers that they have the safest food in town. While preserving this historic site may have created more challenges for the Hardys, they consider it just one more application of reclamation in Gillette. “Mines are required to restore everything. The beautiful land that you drive through on your way into town has already been mined and reclaimed. So that this building is still here and being reused goes along the lines of that same process. We’re making the best use of the resources we have,” Dawn said. While Nate balances two full-time jobs, Dawn has overcome her own obstacles. She hadn’t worked at a restaurant since bussing tables when she was 14, but when her husband told her about his dream of opening a microbrewery, she immediately took steps to fulfill and even improve his vision. Their lives had always revolved around family and so would their business. They knew all too well that shift work hours can make quality family time difficult, but eating out is a good way to maximize that limited time. In a town so heavily impacted by shift work, they wanted to create an atmosphere for kids and adults, so a bar would never work. They needed to serve food for the whole family, and pizza was the obvious pairing. Even with no restaurant experience, Dawn was the manager of a family of nine, so naturally she’d manage their business. She taught herself the inner workings of inventory and payrolls, how to operate a kitchen and what she needed to do to recruit staff. And since Nate was making the beer, she would make the pizza. But Dawn’s biggest challenge wasn’t constructing delicious pizza — it was writing down the recipes. “Having seven kids, you throw together a lot of food, and I cook the way my great- grandma taught me, eyeballing measurements. But I was like, ‘I guess I’d better use a measuring spoon for this,’” she said with a laugh. As rooted in history as Gillette Brewing Company is, the business is also a significant player in Gillette’s future. The small town is quickly garnering a reputation as one of the region’s top foodie destinations. Home to several locally-owned, high-quality dining opportunities, restaurant competition is fierce in Gillette. Dawn and Nate know they have to offer their best, and they’re proud of the results. Dawn’s pizza dough uses Nate’s beers as ingredients, so their crust is truly one-of- a-kind. They hand select all of their produce to ensure the most robust flavors; their homemade sauce depends on it. And Nate’s beer? He likes to let national awards do the talking for him. His American Brown Ale won second place in the US Open Beer Championships as one of 3,500 beers submitted in that category. It’s named Locomotive Brown to honor the industry that runs his community and his family. “The food across town is incredible. Everything is so good. So we try to make the best quality product available. I try to make the best beer I can. Hopefully they realize the soul that we put into our work,” Nate said. “You have to be passionate about putting out a quality product. Otherwise, what’s the point in doing it? I want people to come in here and say, ‘You can tell they love what they’re doing,’” Dawn added. Nate slowly sips on his Tall Canyon Porter. He’s often preoccupied with what’s coming next, like packaging Gillette Brewing Company beers or thinking up new recipes, so he uses this early morning quiet to reflect. He thinks about how each of his kids have worked here along with cousins, nieces and nephews. He acknowledges how his family has grown as every employee becomes a Hardy. He laughs at the countless pizzas his wife has burned as she learned how to use a brick oven and all of the awful beer he’s concocted en route to his shining accomplishments that are featured on tap now. In just a quick glance, he sees the restaurant is pristine. Every chair is in place, every growler on the backbar is facing forward and the antique windows are sparkling. They were high school sweethearts, but his wife still manages to amaze him. Somehow, she remembers order inventory as clearly as customers’ names. She cleans bathrooms to serve as an example that no one is above any job. Nate says a quick prayer of thanks for the partner he’s been blessed with. His long days are short next to hers.